n the spirit of Fourth of July weekend, here are eight facts about the Founding Fathers we bet you haven’t heard before. 1. No one trusted Benjamin Franklin to write the Declaration of Independence. 2. Thomas Jefferson and John Adams both died on the 50th anniversary of our nation’s birth. 3. James Madison was the smallest president in history. 4. George Washington was idolized by Napoleon. 5. 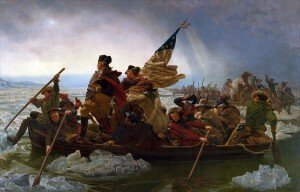 In the famous painting Washington Crossing the Delaware, the man holding the flag is James Monroe. 6. Some Founding Fathers had very strange names for their beloved pets. 7. Thomas Jefferson owned TWO grizzly bears that he kept in a cage on the lawn outside of the White House.